Ted Allen, food expert from Queer Eye for the Straight Guy and judge on Top Chef, visits Murray's and chat's cheese on a recent episode of Weekend Today. Click on the cheese at right to view the video. Yesterday's New York Times Food Section ran an article by noted food scientist and author Harold McGee on Stichelton, a new raw-milk Stilton coming out of the U.K. I'd like to think this article was inspired by one that I wrote back in October for Serious Eats, but who knows? Either way I'm happy this cheese is getting press because it is probably the best blue I've ever had. 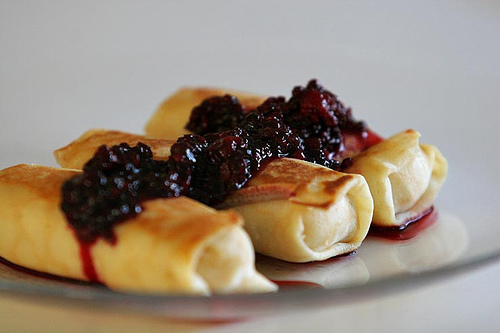 Sweet, creamy, barnyardy, not too "bluey"--it's true perfection. Calling all cheesemaking experts: the following message was recently posted to the forums. Please leave a comment if you have any suggestions! From the Spanish island of Menorca, Mahón is made in the style of regional sheep's milk cheeses, but using raw cow's milk instead. This adaption came about in the 18th century when a large influx of English immigrants brought dairy cows with them to the island. The square-shaped cheese has a golden orange rind (rubbed with olive oil and paprika during aging) that surrounds a tangy paste made salty by the island's Mediterranean breezes. Our faithful reader suggests sprinkling olive oil, ground black pepper and chopped tarragon over slices of Mahón, and serving those with olives, jamón serrano and Madeira. 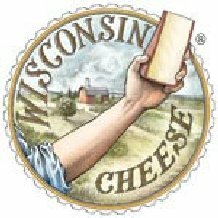 Ed Janus, radio Journalist and Wisconsin resident for over 35 years, has created a wonderful site filled with audio conversations and slideshows that profile a group of dairy farmers and cheesemakers from America's Dairyland. Some of the best and most influential American cheesemakers are profiled, such as Sam and Sid Cook of the award winning Carr Valley Cheese, Mike Gingrich, maker of Pleasant Ridge Reserve, and the Crave Brothers, whose Farmstead Fresh Mozzarella is absolutely heavenly. 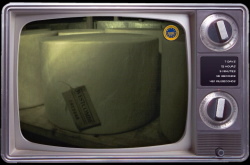 Wedginald, the British Farmstead Cheddar whose year-long aging process has been mercilessly broadcast 24/7 on Cheddarvision.tv, is being auctioned off for charity on Ebay. As of today, Wedginald has been maturing for almost 11 months, and according to the Cheddarvision website will be ready to eat "before Christmas." The current high bid is £520, which comes to almost $1100 with the U.S. dollar as weak as it is. Expensive, yes, but can you really put a price on history? All proceeds will be donated to BBC Children in Need. This week's cheese pairing is Pont l'Evêque with crusty baguette and Norman cider or Merlot. 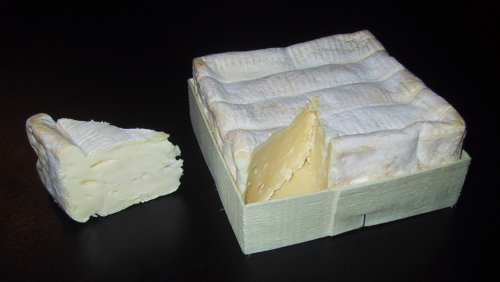 Pont l'Evêque is a small, square-shaped washed-rind cheese from Normandy, and is one of the world's oldest cheeses. There is a reference to the cheese in a document from the 12th century, which states that "a good table always finishes with a dessert d'angelot" (Angelot may have been the historical name for this cheese). 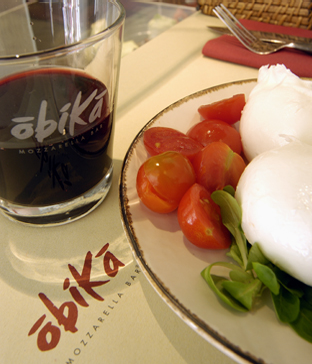 It is a soft, rich cow's milk cheese, whose unctuous and full-flavored paste includes notes of cooked cauliflower. Again, a crusty baguette is a perfect foil for the smooth paste. Norman cider is a great choice of beverage, first because of the regional connection and second because the sweet tartness of the apples will pair nicely with the savoriness of the cheese. For that reason I might also try pairing it with Calvados. As for a wine pairing, French Cheese recommends Condrieu, which has fruity notes from the Viognier grape. I haven't tried a Merlot with Pont L'Evêque; the currant/black cherry flavor and low astringency are definite points in its favor, but I'd be a little wary of pairing a relatively bold wine with such a bold cheese. The November issue of Food & Wine has a little feature on creating an American Cheese Plate by Laura Werlin, a noted expert on American artisan cheeses and author of a new reference book called Laura Werlin's Cheese Essentials . 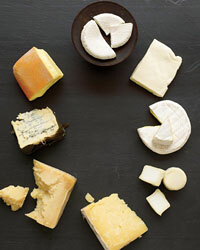 In the piece, Werlin lists 24 great American cheeses (with descriptions) organized into 7 categories. There's also a sidebar that lists some retail shops around the country where these cheeses are available.